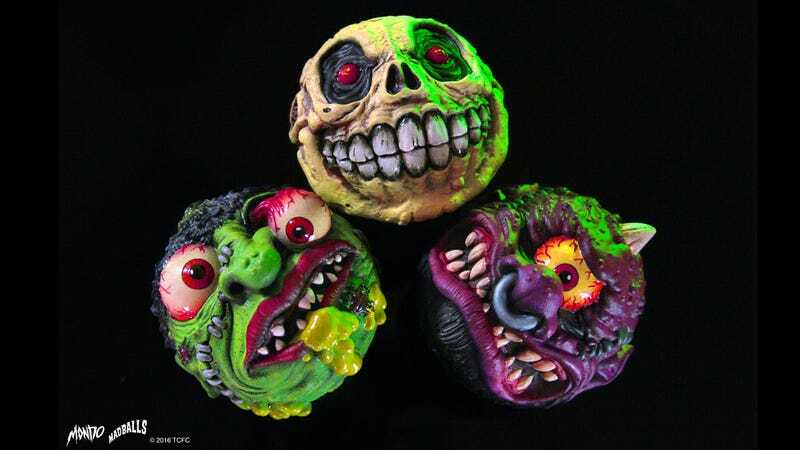 Gross and disgusting was one of the hallmark toy trends of the ‘80s, and because almost everything from that decade is cool once more, Madballs are ready to make an appearance again. Except now they’re being produced by Mondo, who wants everyone to call them MondoBalls. Seriously? There’s nothing wrong with a company sticking its name on a product to help bolster its brand, that’s why Apple tags the back of your iPhone. But it’s going to take some time to get used to calling these hideous foam balls MondoBalls, when deep down in our hearts we know they’re really Madballs. But if that’s the price we have to pay to get our hands on Madballs again, given our originals have probably rotted away by this point, then so be it. According to Entertainment Weekly, the first three MondoBalls, the classic Skull Face, Horn Head, and Slobus, will soon be available for pre-order from Mondo’s site. And thanks to a licensing deal with Marvel, follow-up MondoBalls will be created based on super-villain characters including Venom who’s pictured above. Suddenly we’re totally OK with calling these whatever Mondo wants.